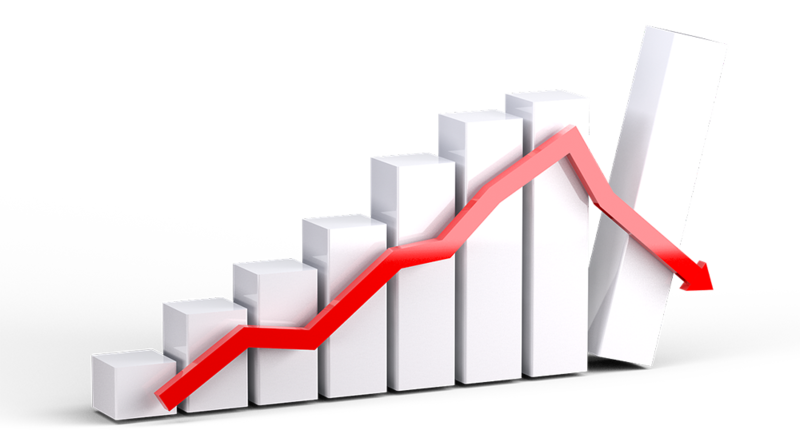 Precious metals expert Michael Ballanger discusses failed trades, as well as three resource companies that have been winners this year. There is an expression that I learned in the fall of 1979 when in discussion with a portfolio manager who toiled for the old and venerable Walwyn Stodgell Cochran Murray Ltd. of Toronto and it goes like this: "Never underestimate the replacement power of equities within an inflationary spiral." The idea here is that since banks control monetary policy and since banks detest policies that reduce the money supply, then monetary policy shall always, one-hundred percent of the time, favor the indiscriminate creation of money. Reeling in profligate spending regimes is contrary to the interests of the global banking fraternity (or cartel) that earns outrageous profits off the ever-expanding supply of currency units, be they dollars, loonies, euros, yen, pounds or yuan. Traders, investors and a myriad of portfolio managers have been carried out of the Capitalist Coliseum on their shields having attempted to short the S&P 500 because of "overvaluation." The failure here lies in misjudging the manner in which $14 trillion in credit creation since 2009 has decided to percolate down into the system, debasing its purchasing power and saving the banking system from certain (not "probable or possible ") collapse. When CNBC runs a cover story entitled "LONGEST BULL RUN EVER" complete with pompoms and drums and flutes, look no further than the U.S. Treasury and the Federal Reserve as rationale. Where the trade failed miserably was in the erosion of the stability and sanctity of cash such that it took more of the diluted purchasing power of American currency units to buy one hundred shares of Apple in 2018 than it did in 2013. The expansion of price-to-earnings multiples, which are historical omens for better business conditions in the future, came about as a function of wildly expanded money-in-circulation chasing the same number and quality of iPhones, NOT due to improved wages and living conditions unless, of course, you are a banker. Fighting the Fed while investing against accommodative monetary policies is like taking a knife to a gunfight; chances are you will lose. The "stretched valuation" meme has been trotted out by visionaries such as Jeff Gundlach, Doug Kass, Peter Schiff, and a handful of other notables including on any given Wednesday, Dennis Gartman, who reserves the right to change his mind whenever he (often) chooses. While I, too, agree that stocks are overpriced by most measures, by way of passive policy moves and/or direct intervention, the Working Group on Capital Markets(the PPT), working alongside the Fed, have been able to keep equity markets elevated with constant surveillance and animated jawboning. Until the Fed signals a hostile shift in policy (and they haven't yet despite the rate hikes), fighting the Fed has been a loser's trade. Shorting the VIX into spikes to above 25 has always resulted in returns to the 10–12 range since the lows of 2009. As the late and quite great Marty Zweig used to say "Don't fight the tape and don't fight the Fed." For the year, the S&P 500 is ahead 8.46% while gold is down a near-identical 8.76%. Silver is off 14.4% so there is a great deal of catching up to do if my forecast of an"up year" is to materialize. This year has been all about the mighty U.S. dollar and how "making America great again" means pumping up U.S. stocks and bludgeoning anything gold, silver or foreign. 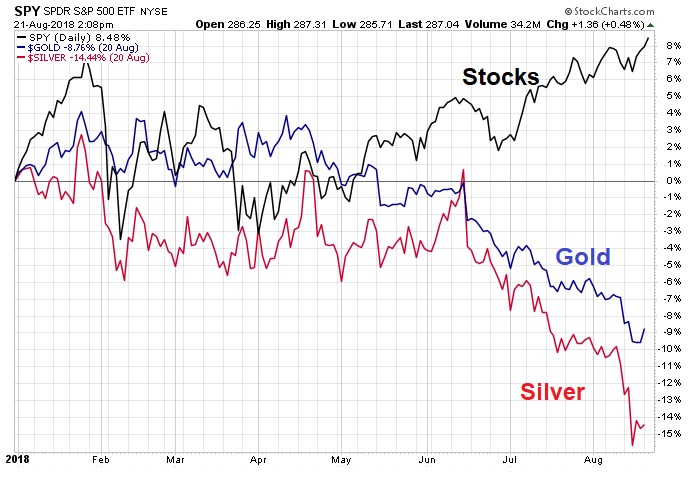 Owning gold and silver in 2018 is now reminiscent of the dog days of the summer of 2015 when everyone HATED junior explorers of all ilk and tone. However, the last month of 2015 saved the year and here in 2018, we have the seasonally strong fourth quarter to do the same. One proviso for the discussion of "seasonality" is that it has been yet another "fail" because expectations of Dewali (Indian wedding season) and restocking by the Italian jewelry trade have been ineffective in triggering anything representing accelerated demand and a subsequent price floor. The failure here was that elevated inflation rates would prompt demand but it hasn't come close to the debilitating impact of the strong USD since trade war rhetoric began. Whether it was the big boys like Barrick and Newmont or the up-and-comers like Argonaut or Fortuna, owning the gold and silver miners was a brutal exercise in masochism. 2018 was the first year in the last ten that I failed to record one trade in the Junior and Senior Gold ETF's but I am seriously contemplating an intiating position in the JNUG (DIrexion Daily Junior gold Miners Bull 3X ETF). Mind you, every time I type in the ticker symbol into the "BUY" box on the order entry machine, a series of sirens and loudspeakers go off with an imposing voice booming out "Warning! Warning ! Warning! You are about to blow your brains out and your wife will divorce you!," which gives one pause before pulling the trigger. I know in my heart of hearts that the junior gold miners are cheap from every aspect of analysis known to mankind, but we all feel like the cat that jumped onto the stove—we absolutely avoid getting burned again by interventions and false bottoms. 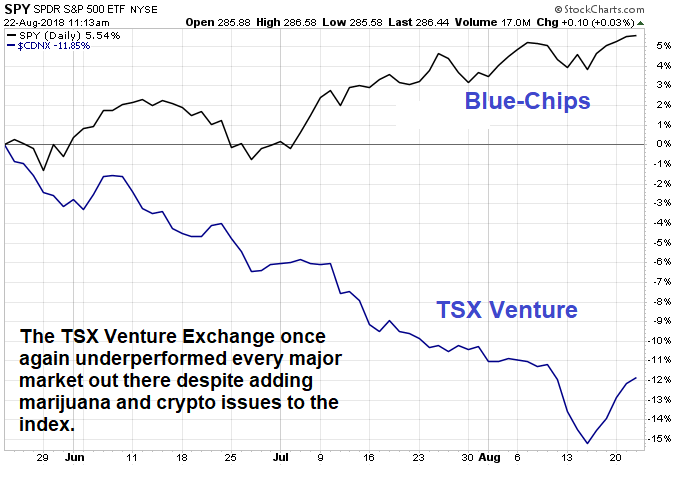 The TSX Venture Exchange has been the host for most of the major mineral finds of the past 50 years but because of growing scarcity and accessbility of new mineral deposits, there have been far too few explorers that have actually found something large and high grade resulting in a windfall return for investors. As I wrote about in July, the trouble this year is that even what appear to be major discoveries are beng deeply discounted and in many cases completely ignored by traders and investors alike. There have been a few exceptions but virtually all facets of this sector were hurt and nowhere more pronounced than in the junior explorcos. As an aside, it is especially brutal when you consider that the guys and gals running the TSXV have been pruning explorcos from the list and replacing them with weed and crypto deals to try to improve the optics required to attract the younger and more adventuresome investment crowd. 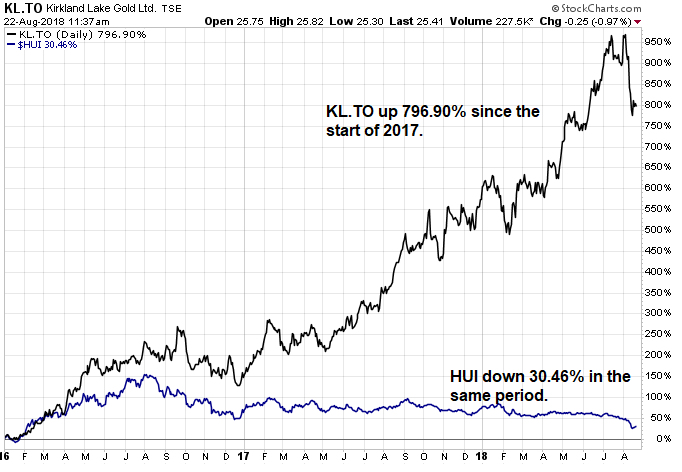 It didn't matter; they avoided the TSXV like the plague. 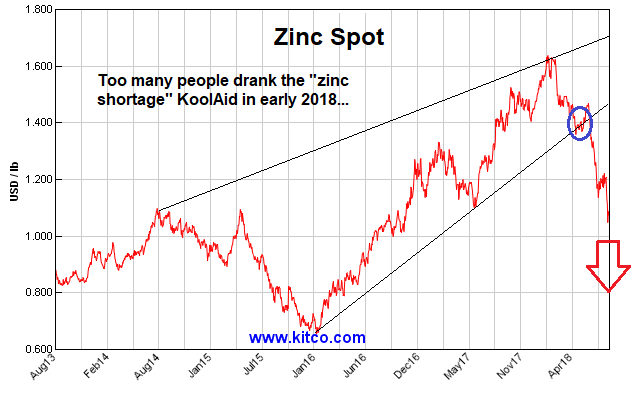 Failed Trade #6: the "The Zinc Trade"
Back in late 2017, I was being accused of "sour grapes" by advising everyone to avoid drinking the KoolAid surrounding the most over-pumped commodity trade of all time—zinc. People tend to forget that I was an early bull on zinc from 2010 to 2016 having raised a great portion of the exploration funds for what became Tinka Resources Ltd.'s Ayawilca zinc discovery of 2012. However, the algo-based parabolic ascent of zinc in 2017 from $0.80/lb. to over $1.60/lb. resulted in an extremely crowded trade where zinc deals were like foreheads: everybody had one. I argued more than once that the screaming zinc price hit $1.40, supply would magically and mysteriously appear knocking price back down. The screams of outrage and protest as investors and traders guzzled the KoolAid made a great many owners of high-cost (and now high-PRICED) zinc deals ecstatic with share prices rising 500–100% on the assumption that zinc would continue to climb to the heavens. Because of the sharp crash in zinc (and copper), dozens of PEAs and FSs are today being reworked with discounted net present value numbers being ratcheted down taking share prices along for the slide. 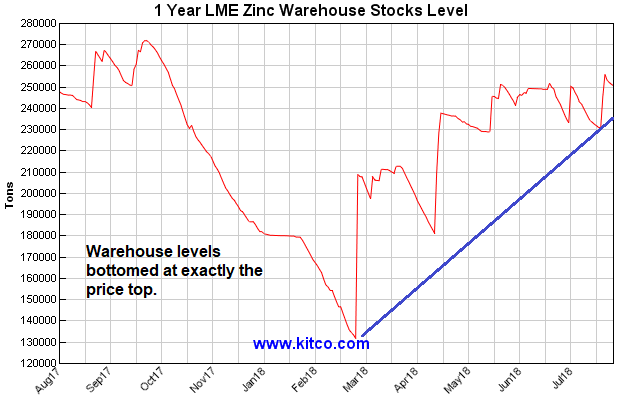 It is a lesson to be remembered and it is aligned with the legendary Bob Farrell's Rule #9, "When all the experts and forecasts agree, something ELSE is going to happen"—and it did —and now a myriad of junior zinc deals are in bear markets with many of their shareholders holding a large and very malodorous bag. 3. Aben Resources Ltd. (ABN:TSX.V; ABNAF:OTCQB, C$0.44): In addition to the spectacular results reported recently (62.4 g/t over 6m) from the Golden Triangle region of B.C., I am delighted that there is finally a company that has raised money, drilled, reported great results, and then was REWARDED. 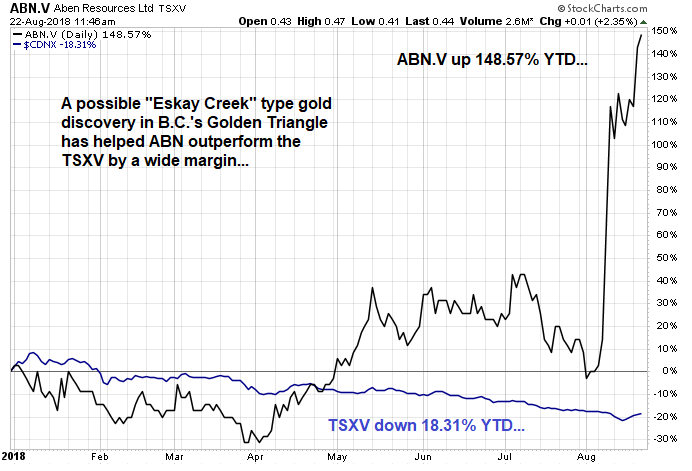 Up 148% in the past month, ABN holds a very special fondness for me because its chairman, Ron Netolitsky, was the driver behind Consolidated Stikine Resources, which owned 50% of the Eskay Creek discovery of 1989, and also because it helped me recover the losses from the 1987 market crash. I first heard about Stikine from Murray Pezim but rather than buy his deal, I elected to go with Netolitsky's and bought 20,000 shares at $0.80 (pre-discovery). I sold the shares four months later for $15/share despite being warned against it by the late Ron Brimacombe. A few months after I sold (recovering $300,000 lost in Oct/'87), International Corona bid $67 per share, which amounted to $1,040,000 being left "on the table." These Aben results are very much on par with the original 1989 discovery and since it appears to be associated with the same fault that yielded the fluids forming the Eskay deposit, I am putting ABN on my recommended list for 2018 on the assumption (and prayer) that this will wind up as yet another 3,000,000-ounce gold and 160,000,000-ounce silver deposit. More importantly, I am hoping that Aben's success triggers a much welcomed renewal of speculative appetites by investors spilling over to the rest of the exchange. One final reason I took the plunge: Aben's chairman is none other than Ron Netolitsky. As they say in sport, you never bet the horse; you ALWAYS bet the jockey. In case you hadn't noticed, all of the "Failed Trades" covered in earlier paragraphs are actually classic "contrarian buys" as we speak. In November of 2015, you could have applied my remarks to all of the precious metals failures because by mid-2016, had you bought into the misery of the precious metals purgatory , you would have made a great deal of money. Final note on the recent bounce in the precious metals : I have yet to add to my GLD holdings because silver fails to lead and because the miners are really having difficulty getting going. I will probably await the COT Report expected this Friday afternoon before deciding whether or not adding to the GLD is worth risking yet another set of locks on the medicine chest and booze cabinet that shall be liberated either by way of unanimous consent or large, ignominious crowbar.